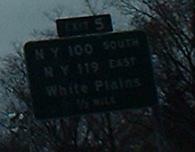 Okay, who extended US 22 into NY? Contractors' errors are fun. 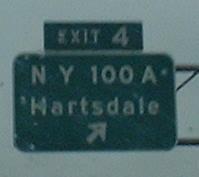 Still up in both directions as of 2004. Starting you right out with something cool, 1970's Michael Summa photos as I-287 WB leaves I-95 NB and then has a U-turn exit for local traffic that just joined from Midland Ave.
Technically the beginning of I-684, but the freeway mainline continues to Hutchinson River Parkway (NY 984J, technically). 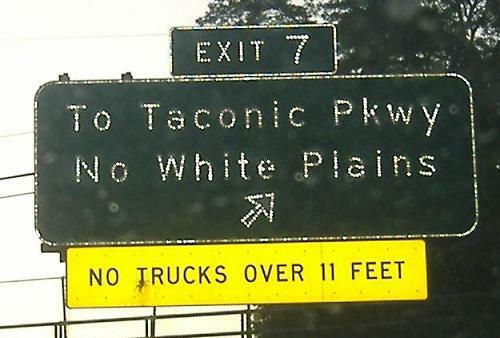 Is that North White Plains, or No White Plains as in "No White Plains for you!"? 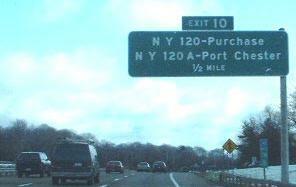 Also a couple of examples of all-text BGS's, the oldest NYSDOT has, dating from somewhere near the completion of the expressway. The last two photos are courtesy Doug Kerr. Side note: Sequential numbering (and special CWE milemarkers) allows for a fudge factor to accomodate the length of I-287 multiplexed with I-87. 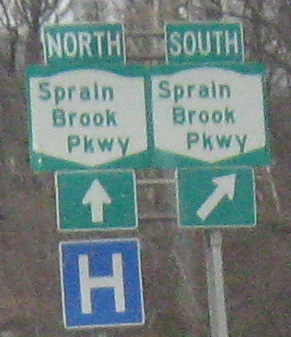 The end of the Exit 3 ramp brings two confusions: the reverse of the normal Parkway shield colors, and a reversal of the order in which a WB traveler would expect to find North and South exits. It's because the SB ramp loops around the top of the interchange. A 1972 photo from Michael Summa. 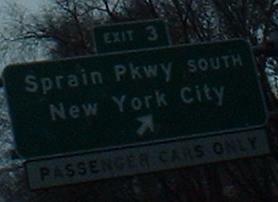 Not a lot changed into the 2000's until the old signs finally started coming down. A WB perspective of the newly opened interchange that finally gives enough capacity to I-287 traffic entering and leaving the I-87 New York Thruway mainline; the SB/EB split favors I-287 three lanes to two, so take "mainline" with a grain of salt. 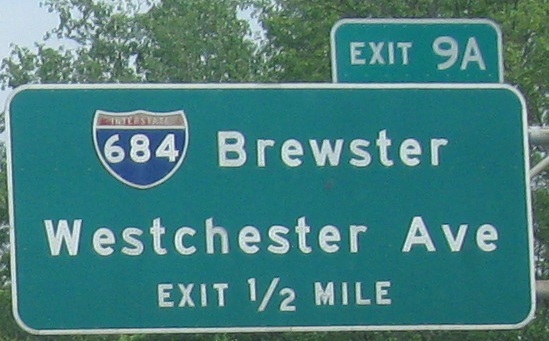 With the new configuration of the I-87/I-287 interchange, this former Exit 1 from I-287 EB is now only accessible from I-87 just south of I-287, even though the ramp runs along 287 for a good half-mile before departing toward this split. The CWE has a few EXIT ONLY signs with green space in between the two words; the MUTCD has long since been updated to call for a single black-on-yellow EXIT ONLY panel across the bottom of a BGS, arrows included. 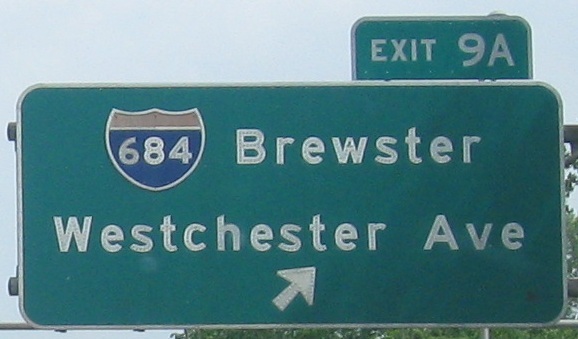 Click for daytime closeup of the old I-287 pull-through BGS. 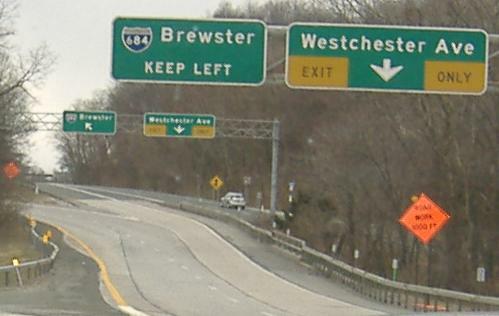 The last two signs are on the ramp to I-684/Westchester Ave. Notice how the original pavement, visible in the third photo, has a one lane exit with the Westchester Ave. ramp tapering to the right, and the second lane of the exit was added about where the Westchester ramp exits. 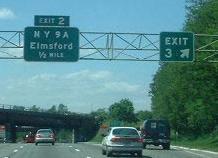 Now, there's a two lane exit, and both lanes head north toward I-684. 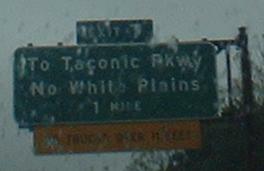 The final picture is once more from Westchester Avenue, which acts as the frontage road for much of the central portion of I-287 (since 287 basically stole its right of way). 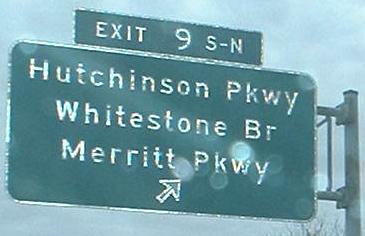 In this case, it not only has its own BGS for the Hutch exits, but the signs on it even have I-287's exit tabs. Slipping one final photo in from Doug Kerr. Here are two bonus photos for you. 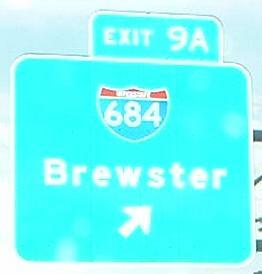 The first is the only shield assembly showing I-287 multiplexed with NY 17, a condition that only lasts a few hundred feet from the NJ border before 17 NB joins I-87 NB and 287 EB (was NB in NJ) joins I-87 SB. 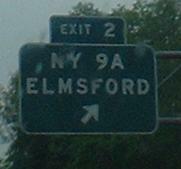 The second is signage at that split; I-287 needs an EAST.